The Gionee Elife S5.1 comes with a custom Gallery app. It defaults to a pre-defined folder view of Albums, Wallpapers, Screenshots, Videos and Others. You can't change this view, nor can you customize the default folders. The Gionee Elife S5.1's player has a simple interface and is very easy to use and navigate. It supports customizable DTS audio customizations. The DTS audio enhancements apply on all music-related apps and games no matter whether you are using headphones or the loudspeaker. There are a few DTS presets you can use, but you can also customize one preset by yourself. Loudspeaker booster mode is also available. The Gionee Elife S5.1 also features an FM Radio aboard, but there is no RDS support or at least our unit didn't have that. The app offers stereo FM recording in the .OGG file format and the recorded files can be accessed via the Sound Recorder app. Interestingly, pop-up play is available, so you can watch a video while doing something else on the phone. The Gionee Elife S5.1 started out very promising in our audio quality test. When plugged in an active external amplifier, the smartphone posted great scores top to bottom and demonstrated very high volume levels to round up one of the better performances for the day. Plug in a pair of headphones however and things quickly go south. Volume levels plummet, stereo crosstalk spikes and a notable amount of intermodulation distortion creeps in. 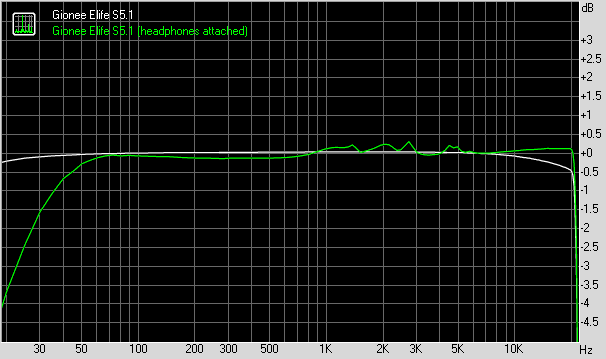 Noise levels and dynamic range are affected too although they still remain very good. Still, the overall result is rather disappointing, which is made worse by the fact that this is the more important test scenario.